I wake later than normal in my darkened room. The sound of the air conditioner fan blowing is the only sound I hear. It has a strange rattle that ticks out a beat and may mean failure soon. I pack my gear with mixed feelings. I am looking forward to meeting my friend Jon but I feel the pull of an end date to this hike. An end date that is only as good as the miles and hours needed to reach the border on that date. On the other hand I haven't seen Jon for a long time and will enjoy spending time with him. I'm done packing early, there's nothing more for me here and I drop my key in the key dropbox. I am back on the trail, well, road at this point, it's twenty miles of road between here and the trail. Twenty miles that Jon and I will spend talking. I head down to the Mountain Goat Coffee shop. This is our planned meeting spot. I sit out in front reading the news, something I haven't done in a long time. I'm about thirty minutes early and Jon is a prompt person. Sure enough, to the minute, he arrives. I walk out to his car. He's brought his new daughter, whom I haven't met yet. Only months old, Jon’s loving his new daddy role. We grab all the stuff we need to care for a baby and go inside the coffee shop. I get a mocha, Jon gets a coffee. I get a blueberry muffin for each of us. Freshly baked on the premises and still warm. We sit at a table and we chat while Jon preps the food for his daughter. I watch as he spackles her face with food, every so often getting some into her mouth. I remember those days, sliding the spoon around my kid’s face trying to scrape off the food I just deposited there off and into their mouth. Jon’s doing great. I drink my coffee while he decides to give her a handful of Cheerio-like star snacks. Not sure if the table’s clean so he spreads out a napkin and puts the handful of stars on it. She reaches up and grabs the napkin sending shooting stars flying down to the ground sucked into the earth’s gravitational pull. They don't fall far enough to burn or sparkle. They just bounce along the ground and lie where they stop. “I shoulda seen that coming,” Jon says. It's amazing how much a new baby teaches a young parent. Jon is in full learning mode. We arrive at the Kracker Barrel. What a contrast from yesterday. There aren't any packs lined up outside and maybe one or two hikers inside. The wave has passed on to the north. I have felt the pull of the wave as the hikers feed off each other's energy and move like a wave moves towards a beach. They increase their pace and begin leapfrogging, tumbling past each of like the water does down the face of a wave. They all speed up and no one wants to be left behind. So they're gone. The trail’s probably clear of hikers for miles. I'm in the lull, the flat spot between waves. If there was an ideal day for hiking this would be it. It's cool but not cold. The sun is warm. There are enough trees to keep me out of the sun. The azure sky can be seen between the trees, brilliant and clear without clouds. 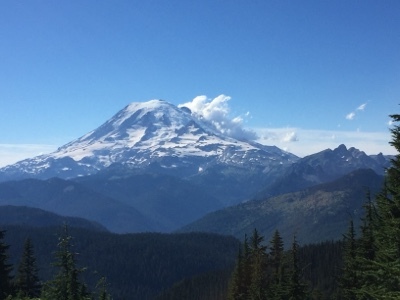 Mt Rainier took off her hat and stands uncovered beneath the summer sun. The trail meanders through an open forest. Every once in awhile I pass an aquamarine lake. I can see it sparkling in the sun between the trees. Some have day hikers perched around them with fishing poles but most are vacant. Beautiful lakes for camping with flat empty campsites next to them. I decide that I am no longer going to worry or think about miles or time and just enjoy hiking these last couple of weeks. The day remains spectacular. It's warm with a slight breeze to keep things cool. The trail intermittently passes through blueberry bushes. These are not huckleberries, the bushes are too short and the berries are a dull blue color. They taste the same, just like blueberries. On and on the trail goes. My resolution to not think about time and miles ends in the middle of the afternoon. I realize that I have a four mile climb. After the climb is another eight miles of ridge walking to get to where I want to camp. The day is slipping away and I want to be at camp before dark. I eat some of my snacks including a Gu energy gel and then start the climb. I try walking as fast as I can. Sometimes, like today, I get into a rhythm that is really quite fast. Up and up I go, nonstop. I feel strong and untiring, thousands of miles of exercise will do that. I climb through the forest up switchbacks. Back and forth across the slope I go. I step carefully, watching the trail is my number one priority. My steps are sure and on solid ground. I avoid stepping on rocks or logs if I can avoid them or step over them. Higher and higher I climb. Out of the trees into up into the alpine zone with rocks, small trees, and wildflowers. I climb up and around a spur of the mountain and there right in front of me is Mt Rainier. No hat right now but it looks really windy. Billowing white clouds pour from the summit looking like smoke. I zip across the ridge. “Eight miles is not that far,” I keep telling myself. On I go, as I do the sun continues to descend in the western sky. Later and later it gets. The ridge is breezy until I turn and drop below the top. Down I go, I pass a small lake and traverse through an unlikely forest. So many times the forest looks like there's no room for a lake, this is one of those times. Then suddenly I'm there. A spring gushes water down the hill and across the trail. I get my camping water and head further down towards the lake. Empty camps, I choose a flat one as far from the trail as I can. It's late, the sun has already set behind the ridge. It's deathly quiet. No breeze, no sound of water flowing. Silence. It's eerie to camp by myself sometimes. I could really start to freak myself out. All I need to do is start imagining things moving through the woods. “Did I just see something?” And then it gets scary. So I do ask, I don't look. I focus on my tasks. Set up tent, check. I sit on a soft rotting log and prop my food bags against it next to my legs. In front of me is my pot sitting on my stove. Alcohol stoves burn silently so there is no sound until the water starts to simmer. A crow flies overhead between the trees. It's wings making a fwhip, fwhip, fwhip sound as it passes overhead. Then it says, “ha, ha, ha.” As if it knows something that I don't know. Maybe it does. Why is it so quiet here? The wind from the ridge doesn't reach these trees, it's utterly still. I could hear a twig snap at a hundred yards. I hear nothing. My water simmers and boils. I cook my food a few minutes, boiling the bag with my rehydrating food in the water. I at some tuna and mayonnaise. I drink a some electrolytes. Finally I eat my dinner after it has had time to fully rehydrate. It tastes so much better to wait. It's getting dark by the time I'm getting in my tent. I hear a couple of hikers speed by on the trail. There are a lot of hikers that hike until dark. That's not my thing. I like a few hours of daylight to set up camp and cook. Today's cutting it really close, but it was worth it to see Jon again. I lay in my tent thinking of the beautiful day and wonder if the forecast of rain is wrong.